Have your own laptop or tablet? Our wireless network has been improved and is now faster than ever! St. Thomas Public Library has 20 public computer workstations! 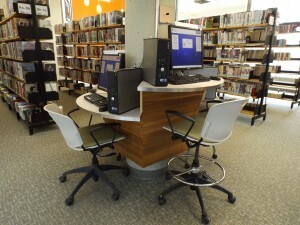 The computers are available on a first-come first-served basis, and are free to use upon presentation of a valid St. Thomas Public Library library card, for up to two hours per day. You must agree to the Internet access policy to connect to the library’s network. All information, saved or not, is lost when a session ends. Anything saved in My Documents or on the Desktop, as well as your Internet search history will be removed when you log off your session. Did you know that you can print at the library? Now it is easier than ever! We have 2 printers available to the public – one on the main floor, and one in the Children and Teens’ department on the lower level. Select the printer you would like to use. Browse your computer and select the file you want to print OR copy-paste the URL of the webpage you want to print. Press the green printer icon. Wait until your request has successfully been processed. Once your print job has been processed, go to the print release terminal, the computer located right next to the printer. Locate your email address from the list on the screen, select your print job, and push “print”. You will be prompted to enter coins in the coin machine. Once you have paid, your print job will be released, and your document will print! Download the free PrinterON app. Find our printers, by pressing the box with the little printer icon, that says “no printer selected”. Select “search” and type “STPL”. You will see our 4 printing options (Children & Teens Black & White, Adult Colour, Adult Black & White, Children and Teens Colour). You can either “save” the printer, so that it will be easier to find again in the future, or you can simply click the checkmark in the upper right hand corner of the window. Next, select the document, photo, or webpage you want to print, by clicking the appropriate icon. Once you have selected your document/photo/webpage, simply click the little printer icon in the upper right hand corner of the screen. You will see a sample of the page you want to print. Always double check to make sure you have selected the correct printer. If you are satisfied, click “print” at the bottom of the page. You will be prompted to enter your email address. This is how you will identify your print job at the print release terminal. Wait for the job to be processed. Once your print job has been processed (you will see a green “Job Success!” bar on your screen), go to the print release terminal, the computer located right next to the printer. The Library provides access to all content that is available on the Internet, and it does not utilize any content-filtering technology. Please refer to our policy on Wireless Internet Use, as well as Use of Electronic Resources, which can be found on our Policies and Plans page.